Spring into warm weather with this special offer and receive complimentary cocktails, flowers & more. Looking to learn more about The Blackstone's storied past? Take a walk through history with us. 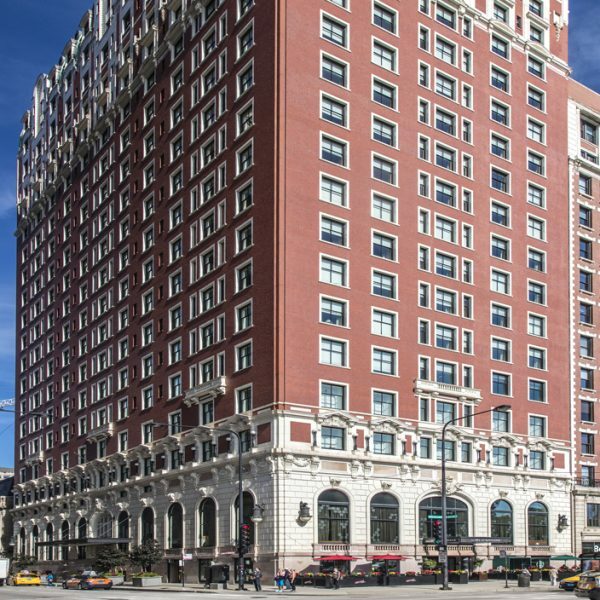 The Blackstone Hotel is a storied architectural icon rooted in Chicago's legendary past. Updated with all the modern amenities and features of today, The Blackstone delivers a distinguished hospitality experience perfect for the discerning traveler. Our downtown Chicago hotel is blooming as a point of cultural and creative discovery on the Cultural Mile. We are proud to offer guests modern accommodations with views of Lake Michigan and Grant Park, acclaimed dining at Mercat a la Planxa, craft cocktails and entertainment at Timothy's Hutch, refined meeting spaces, and thoughtful details like our Chicago-inspired Fitness Center, expert Concierge service, and more. Reserve your room or suite and enjoy features such as marble bath facilities, customized La Bottega amenities, modern decor, high-speed Wi-Fi, plush bedding and in-room dining. Whether you are here for business or pleasure, this stunning hotel in downtown Chicago will ensure a restful and revitalizing stay. With stories to tell, The Blackstone is set to surprise, entertain, and inspire with a clever contemporary attitude. Take me out to the ball game! Watch the Miami Marlins play the Chicago Cubs at historic Wrigley Field. Take me out to the ball game! Watch the Milwaukee Brewers play the Chicago Cubs at historic Wrigley Field. Take me out to the ball game! Watch the Cleveland Indians play the Chicago White Sox at Guaranteed Rate Field. Take me out to the ball game! Watch the Toronto Blue Jays play the Chicago White Sox at Guaranteed Rate Field. Take me out to the ball game! Watch the Philadelphia Phillies play the Chicago Cubs at historic Wrigley Field. Take me out to the ball game! Watch the Cincinnati Reds play the Chicago Cubs at historic Wrigley Field. Celebrate Memorial Day in Chicago! Get Ready for the Ultimate Bike Ride down Lake Shore Drive! Kick-Off Millennium Park's Festival Season at the Chicago Gospel Music Festival! See top top local, national and international artists for free at Millennium Park! Catch Your Favorite Flick on the Pritzker Pavilion Lawn with Family and Friends! Take me out to the ball game! Watch the Colorado Rockies play the Chicago Cubs at historic Wrigley Field. Take me out to the ball game! Watch the Washington Nationals play the Chicago White Sox at Guaranteed Rate Field. Take me out to the ball game! Watch the New York Yankees play the Chicago White Sox at Guaranteed Rate Field. Play ball! Watch the long-standing Chicago sports rivalry between the Chicago White Sox and the Chicago Cubs. Take me out to the ball game! Watch the New York Mets play the Chicago Cubs at historic Wrigley Field. Take me out to the ball game! Watch the Atlanta Braves play the Chicago Cubs at historic Wrigley Field. Dance Your Way Through The Summertime in Chicago! Take me out to the ball game! Watch the Minnesota Twins play the Chicago White Sox at Guaranteed Rate Field. Play ball! Watch the long-standing Chicago sports rivalry between the Chicago Cubs and the Chicago White Sox. Take me out to the ball game! Watch the San Diego Padres play the Chicago Cubs at historic Wrigley Field. Take me out to the ball game! Watch the Miami Marlins play the Chicago White Sox at Guaranteed Rate Field. Take me out to the ball game! Watch the New York Mets play the Chicago White Sox at Guaranteed Rate Field. Take me out to the ball game! Watch the Oakland Athletics play the Chicago Cubs at historic Wrigley Field. Take me out to the ball game! Watch the Oakland Athletics play the Chicago White Sox at Guaranteed Rate Field. Let's Be Frank, Chicago Hot Dog Fest is the Place to be this August! Take me out to the ball game! Watch the Houston Astros play the Chicago White Sox at Guaranteed Rate Field. Take me out to the ball game! Watch the San Francisco Giants play the Chicago Cubs at historic Wrigley Field. Take me out to the ball game! Watch the Texas Rangers play the Chicago White Sox at Guaranteed Rate Field. Take me out to the ball game! Watch the Washington Nationals play the Chicago Cubs at historic Wrigley Field. Take me out to the ball game! Watch the Seattle Mariners play the Chicago Cubs at historic Wrigley Field. Take me out to the ball game! Watch the Los Angeles Angels play the Chicago White Sox at Guaranteed Rate Field. Don't miss out on this year's epic set of performances at the World Music Festival! Attend the Highly Anticipated Annual Chicago Marathon as a Runner or Spectator! Celebrate Columbus Day in Chicago! Explore a side of Chicago rarely seen this October. Attend Chicago's Hauntingly Creative Parade! Experience a dynamic international marketplace and community held at Navy Pier Chicago this fall. Experience holiday magic on the Magnificent Mile! Priceless, memories made! Great staff and phenomenal rooms. It will be our new home in Chicago. Hosted a corporate luncheon for 15 guests this fall. Everything was perfect, and all of my attendees raved about the food. The staff were very attentive and accommodating. Will definitely be back! This place is gorgeously done, and has a wonderful sense of humor... love all the little touches and stories celebrating its history. I walked into my hotel room and it is definitely one of the most beautiful rooms with a view I've ever been to...I love the hip wallpaper, the generous closet, comfy chair and footrest. I am loving The Blackstone! "We Stayed in the Suite of Presidents!" My wife and I visited the hotel and stayed in their famous suite. This suite has an incredible history of hosting presidents and world leaders. You could say it is “the room where it happened”. A wedding at The Blackstone is a one-of-a-kind experience. We had high expectations and The Blackstone met every one...The flexibility to accommodate our needs was outstanding.